If you spoke to be prior to our honeymoon and were to ask "What are you most looking forward to", my response would have been Venice. I have always wanted to go to Venice, the magical city in the water. Ride in a gondola and stroll the romantic streets. I can sadly tell you first hand, while it is beautiful, the city did not live up to my expectations. Our trip started out rough with a 6am flight out of ORLY, Paris. We were told we needed to be there 2 hours ahead of time. Wrong. We got up at 3am, after only going to bed at 12:30am following our fabulous Eiffel Tower dinner. I figured we could sleep on the plane. Wrong. After landing and being extremely tired at 8am, we waited in line for an hour to get our travel figured out into Venice. Finally learning the correct bus number and taxi boat number, we were on our way. We finally arrived in Venice and headed towards our bed and breakfast, to learn VERY quickly that there are not street names in Venice. It was a maze trying to find our location and Siri was very confused. We got lost with multiple pieces of luggage. Guess what Venice has - bridges with stairs....a lot of them, everywhere you go. We had to ask for directions, realizing we were exactly where we needed to be - our B&B was unmarked. We threw our bags in the room and headed off. While this photo from Ritalo Bridge is stunning, what you don't see is the thousands of people standing in my exact location, taking photos. It was a zoo and I was losing patience fast. Here's a tip if you are traveling abroad, while connected to WIFI, put your location in your GPS. Then go back into airplane mode. The GPS will still pick up where you are without using your data. However, this didn't work well in a city with no street names. I read on trip advisor of this place called Dal Moro's Pasta to Go. It's ranked #1 on TA, was cheap and fresh homemade pasta. We spent an hour looking for the place since we got lost again but finally found it hidden in an alley. Luckily I recalled what the outside looked like thanks to Trip Advisor. We each ordered the Spicy Red Sauce with Chicken Sausage and Basil. 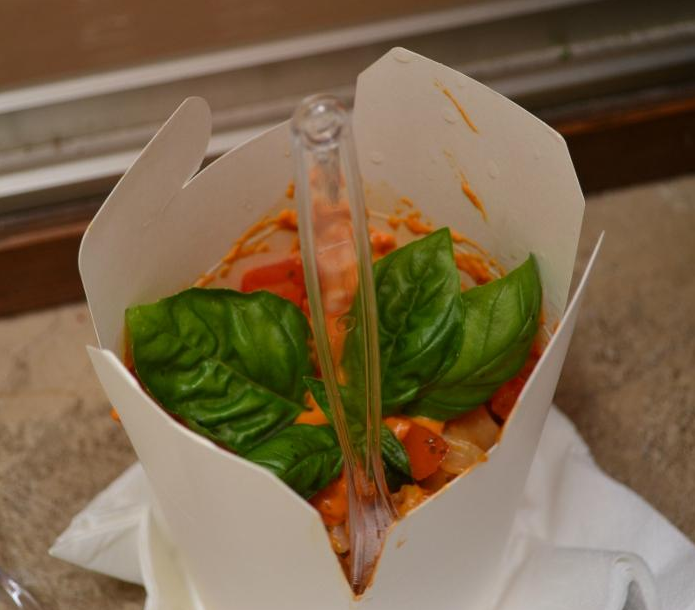 This was honestly the freshest pasta I have ever tried. Our lunch cost 19 Euro (a little less than $25 USD) for two orders of pasta with meat, prosecco, a soda, and a bottle of water. We joked at the time that this would be the cheapest meal of our trip. Little did we know that eating and drinking in Italy would be so affordable. Following lunch, we headed out to St. Marks Square. We also learned there were 2 cruise ships in port, which meant thousands upon thousands of people everywhere you turned. Plus, everywhere you walked, a street vendor was trying to push their product on you. It was like a giant Italian Flea Market and I did not like this experience whatsoever. 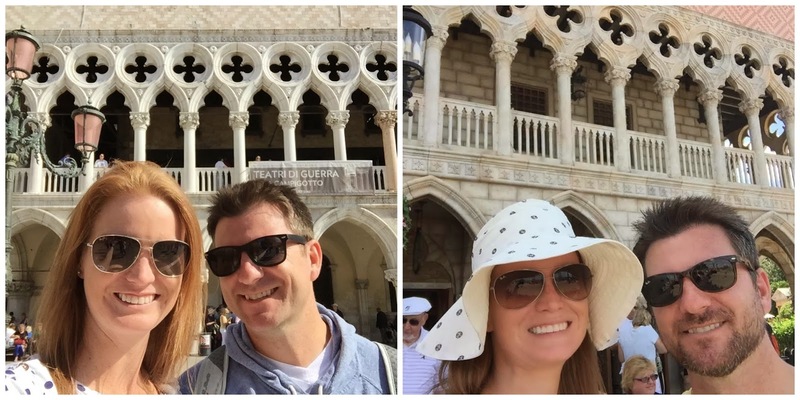 We had pre-paid timed reservations to go into St. Marks Basilica but couldn't figure out where to use them at. So we waited in line like everyone else, to learn we couldn't bring any large bags in. Off we went to find a storage locker. Guess what was inside our bag? Our Euro's.....so after we got back into the Basilica, we were unable to climb up since there was a 5 Euro fee per person. At that point, we were both over it but snagged a few photos of the church itself and headed out. We were both exhausted at this point and it was only 2:00. Our pre-paid gondola ride was scheduled at 4:00. I instantly regretted buying the gondola ride in advance. There were gondoliers everywhere yet we had to wait around for hours, instead of being able to go take a much needed nap. Neither of us wanted to venture out this way again (which would have led to us getting lost). So we found a precious garden bar on the water and drank some wine (me) and mojitos (Gabe). It was perfect. After we relaxed a bit at the bar, we headed in the general direction of the gondola, only to get lost!!! If you are keeping track, this is now the 4th time we got lost and the day wasn't halfway over. On our way to the gondola which we thought didn't exist after not finding it for over an hour, we were hassled by about 25 times by people asking if we wanted to buy everything from selfie sticks, to fake Louis Vuittons. Things started going downhill fast and I knew my temper was not long for this world. We finally found the area where we needed to be, only to find ourselves with close to 100 other people. It was a zoo. We sat down and waited for our gondola to start. Our 4:00 reservations turned to 4:15, Finally our name was called and within a few minutes, I launched into a full blown temper tantrum. We were placed in a gondola with 2 other couples and Gabe and I got separated. We knew going in that we would share the gondola with others....but they literally had us sitting in different areas of the boat. THIS WAS NOT OK. I said way too loudly, "THIS is BS, we are on our honeymoon and you are separating us?!" I caused a scene.....and because of this, Gabe didn't want to go in a different boat since he was already embarrassed. The photo below is from another Gondola. See the person in green? That was my seat. See the person he is talking to? That was Gabe's seat. What I should've done was kindly ask if we could sit together because it was our honeymoon. However, the stress from the day and lack of sleep got to me. $100 USD later, my new husband and I didn't get to sit together on a Gondola ride I bought 3+ months ago. Not to mention, our gondola driver was awful. 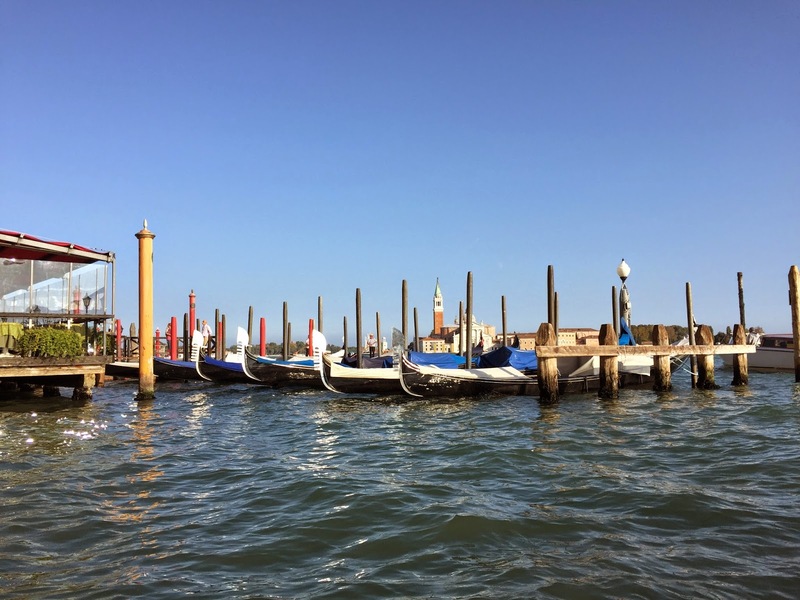 He rode side by side with another gondolier, where they talked to each other the whole time. The only good thing that came out of this experience is that I crossed something off my bucket list. We had to walk back through the square on the way home and I took the opportunity to get a picture with a ton of pigeons. Gabe and I were both very exhausted at this point. We headed back to the hotel so we could take a nap and then go out for a nice dinner. EXCEPT we got lost.....for THREE HOURS. When we finally got back to the hotel, I passed out at 8pm and slept for 12 hours. So much for a romantic night out in Venice. Just to be funny, I put a photo of us in the real Venice (left) and Epcot's Venice (right). Not stay in Venice. Take a 2 hour train in from Florence instead and spend a day in the city vs. overnight. Getting lost with luggage in Venice is something I will never forget and never experience again. Well, I must say, you still look great despite the frustrations! lol. Venice has always been on my must-visit list too, but I'll definitely heed your advice. Tons of people all in one area drives me absolutely nuts.